1. US stocks surged early as investors shrugged off trade war concerns, but struggled to hold onto their gains. 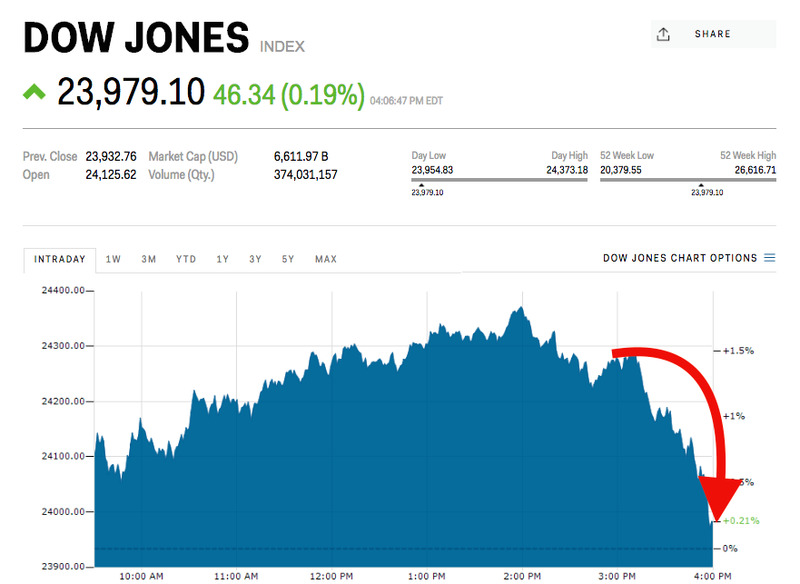 The Dow Jones industrial average nearly erased its 400-point gain following reports of an FBI raid on the office of Michael Cohen, President Trump’s lawyer. 2. Still, many tech stocks climbed their way out of last week’s rout. Shares of Google and Apple were up about 1%, while shares of Facebook gained 0.34%. Despite a major data breach scandal, users don’t seem to be leaving the platform. But Tesla had a rough session, falling below a key support level. 3. And in the latest on trade wars, President Trump expressed some optimism overnight that the US and China will still come to an agreement. All eyes will now be on Chinese President Xi Jinping when he delivers a keynote address at the Bo’ao Forum today. Iron ore futures are surging ahead of Xi’s speech. 4. In currencies, the US dollar index fell back below 90 as the greenback declined for the second straight session, losing ground against the yen and euro. Meanwhile, the Russian ruble fell by 3% against the USD as the Trump administration announced sanctions against government officials. Russian stocks had their biggest one-day drop in four years. 5. With the USD struggling for traction, the US budget deficit is now expected to surpass $US1 trillion by 2020, according to Congressional Budget Office data, which is two years earlier than previously thought. The Republican tax overhaul and spending increases will boost growth in the near-term, the data suggested, but could slow to a sluggish 1.80% in two years. 6. And lastly, billionaire hedge fund manager Ray Dalio says it’s not just trade wars we should be worried about. In a LinkedIn post overnight, Dalio said tensions between the US and China could become a catalyst for further geo-political crises including capital wars and cyber wars. Chinese President Xi Jinping will give the keynote address at the Bo’ao Forum. US producer prices will be released tonight. Also tonight, Facebook CEO Mark Zuckerberg will testify before two Senate committees.